Hoy me llegó esto, dado que soy libra y me gusta particularmente mi signo le puse más atención que de costumbre, y luego ví los nombres de las mayores estrellas y me gusto tres veces más. The waxing crescent moon and the constellation Libra’s two major stars – Zubenelgenubi and Zubeneschamali – appear rather low in your southwest sky at nightfall. 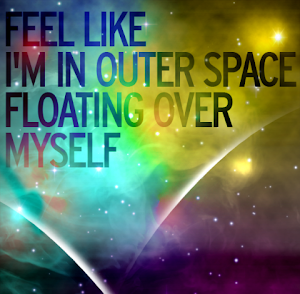 The moon can help you find these stars. As evening deepens, the moon and these Libra stars descend westward, to sink beneath the southwest horizon by mid to late evening. Zubenelgenubi has the star designation “alpha” in the constellation Libra, even though Zubeneschamali is the slightly brighter star. Zubenelgenubi sits almost exactly on the ecliptic – the sun’s annual path in front of the background stars. If you could see the stars during the daytime, you’d see the sun and Zubenelgenubi in conjunction on or near November 7 every year. The sun goes by Zubenelgenubi once a year, but the moon sweeps by Zubenelgenubi every month. Unlike the sun, the moon can swing anywhere from 5 degrees (10 moon diameters) north to 5 degrees south of this star. 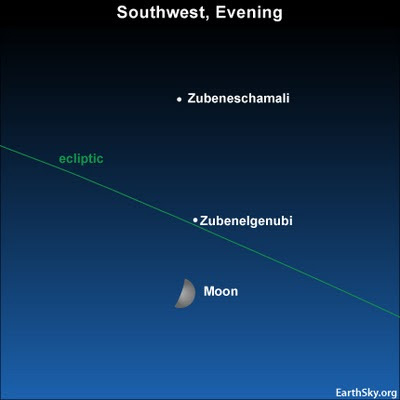 For the next few years, the moon will pass to the south of (below) Zubenelgenubi.